It wasn’t actually too long after I got into knitting that I also took up spinning. There’s something immensely satisfying about knitting with handspun yarn, it’s so much more “alive” than most mill spun yarn. 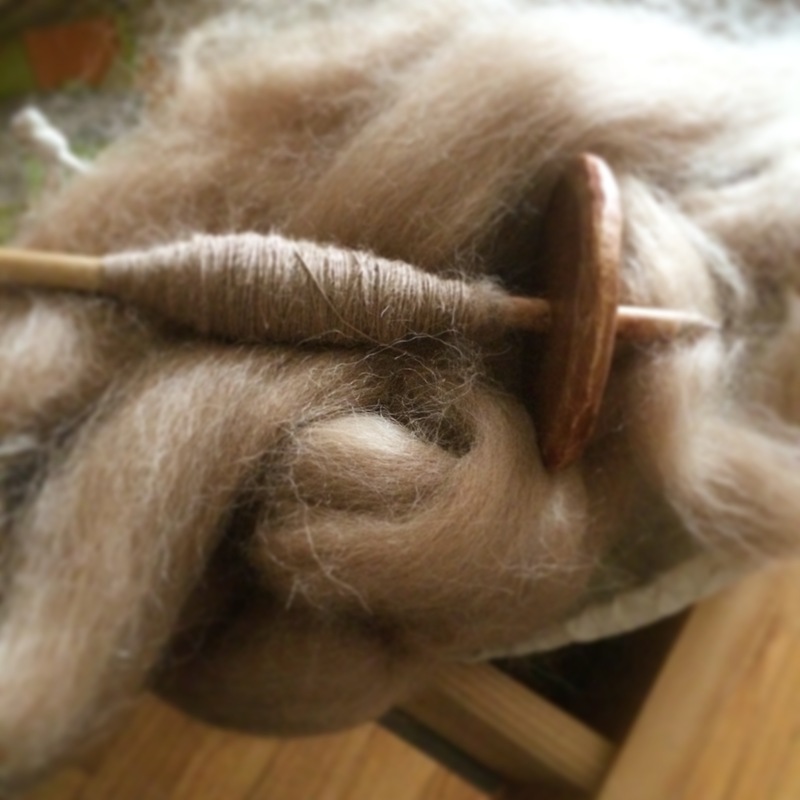 Though unlike knitting and sewing, my spinning mojo seems to come and go more with more frequency. Because of this, I tend to spin accessory quantities of yarn, and I’ve never knit a sweater entirely out of handspun before. This sweater started when Michele offloaded a a giant ball of camel colored alpaca fiber on me – I figured it was about 8 oz or so and started spindle spinning it into a 2ply lace weight – which is my favorite yarn to spin (as well as knit). 3 oz of lace weight spinning later, I hadn’t made a dent. I was sick of the project, and it turns out that ball of fiber was closer to 12 oz. 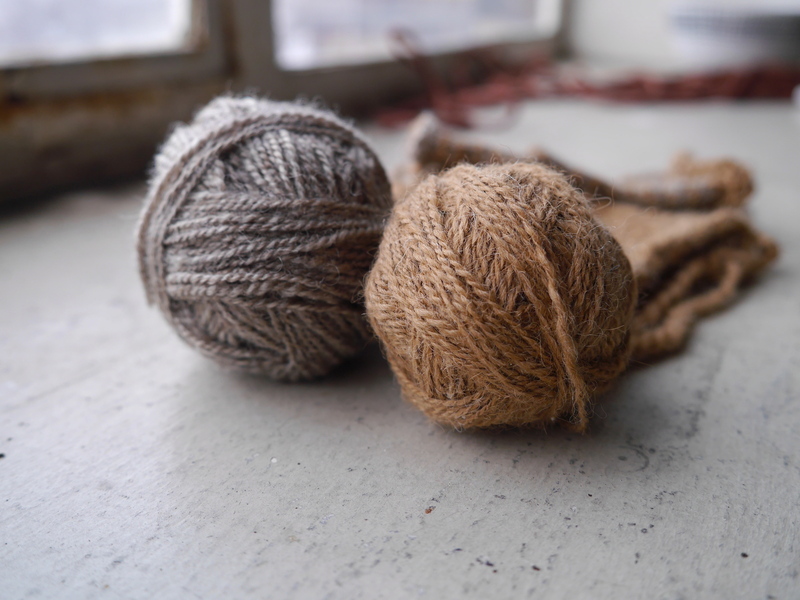 So, I have 3 oz of very thin spindle spun camel colored alpaca (about 250 yards/228.5 meters), and 9 oz of much thicker miniSpinner spun camel colored alpaca (about 500 yards/457 meters). 750 yards (686 meters) total – not enough for a sweater, and too much for most accessories. At this point, I kind of had my heart set on knitting a sweater out of this handspun yarn. So, enter 2 oz of beautiful grey BFL,* which I spindle spun into 250 yards (228.5 meters) of lace weight yarn. *BFL is short for “bluefaced leicester,” which is a type of sheep. All together everything added up to approximately 1,000 yards (914.5 meters) and 14 oz of handspun yarn. 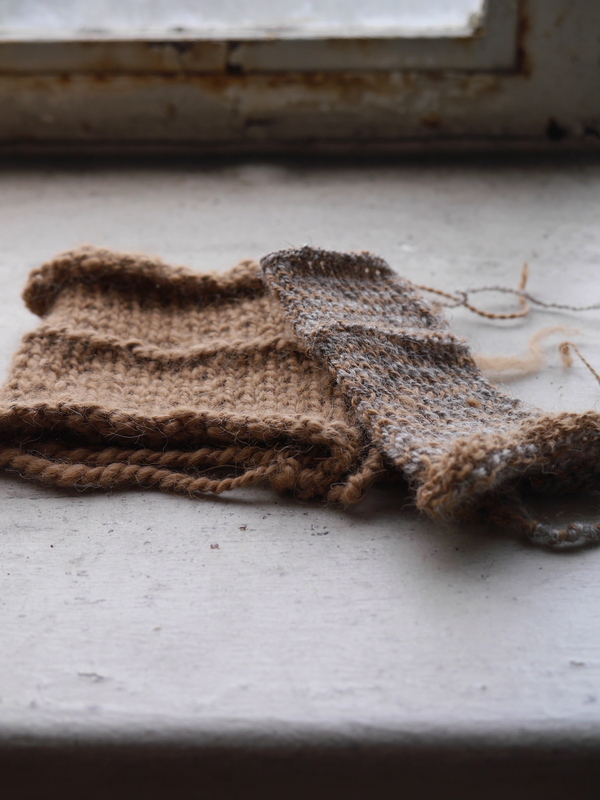 I would be cutting it super close, but I might have just enough yardage for a handspun & hand knit sweater. In the end, I cut it super close, I only had a couple grams left over, but I knit a sweater out of handspun yarn! Since this post is already getting a little long, I’ll save the nitty-gritty sweater details for tomorrow. 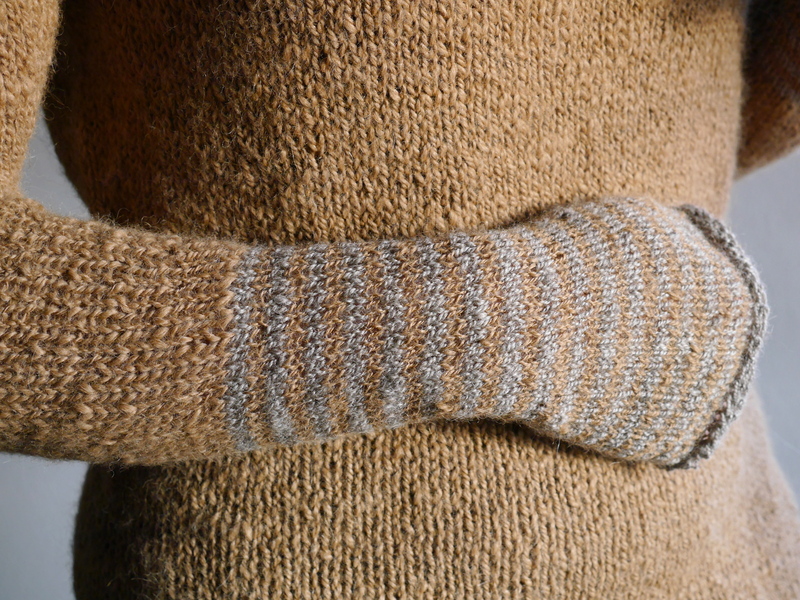 Oh it looks like the handspun sweater came out beautifully, cannot wait for the blog with all the details. Thanks Tahnee! I’m working on that post now, it should be out soon! Ahhh, that looks amazing already! I’ve begun amassing fiber in quantities large enough for sweater knitting. It’s a lot more affordable than sweater quantities of yarn for people of larger size, and now I can’t get the idea of a handknit sweater out of my head. Looking forward to more pics! Thanks Alicia. 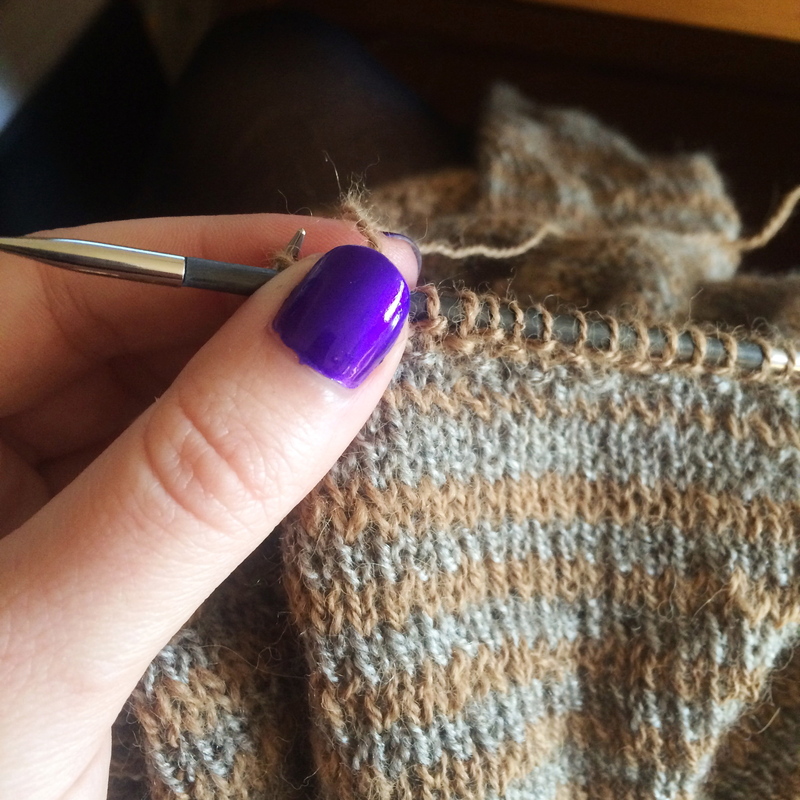 I loved the process of spinning & knitting a whole sweater. It’s not something I’d do all the time, though I would say, if you’re thinking about it do it! – it’s immensely satisfying. It’s beautiful. I love the texture of the fabric and the color choices.